Hekmat et al. Daily assessment of organ dysfunction and survival in intensive care unit cardiac surgical patients. Ann Thoracic Surg. 2005 May;79(5):1555-62. Hekmat et al. Prediction of mortality in intensive care unit cardiac surgical patients. Eur J Cardiothorac Surg. 2010 Jul;38(1):104-9. In a time of spiraling health costs, limitation of resources has become a reality also in cardiac surgical intensive care units (ICU). Therefore, it is of substantial importance to clarify decision-making within the present ICU structure. It would be of great advantage to have a simple predictive scoring system for this highly specialized patient group rather than one of the general scoring systems available for a wide spectrum of patients. Most of these scoring systems have excluded cardiac surgery patients [1, 2], as the acute patho-physiological sequelae of cardiopulmonary bypass are transient, and may have no impact on outcome [3, 4]. Thus, outcome prediction in cardiac surgical patients in the postoperative intensive care period may be unreliable. Most of the general scoring systems require extensive descriptor data collection, which limit their use in routine postoperative cardiac surgical patients [4, 5]. Predictive accuracy, specificity and simplicity are factors of any scoring system governing its daily use in cardiac surgical ICU. The aim of this study was to develop a new specific and simple postoperative score to produce daily prognostic estimates for critically ill adult ICU cardiac surgical patients. These daily risk estimates could be useful for measuring the benefit of therapy during the ICU stay, and for evaluating new therapies. Just as repeated tests of white blood count and measurements of temperature assess progress or the lack of benefit in treating infection, repeated risk score measures may have the potential of predicting and defining the benefit of ongoing ICU treatment . Patients and Data Collection. The study was conducted in a cardiothoracic surgical intensive care unit with 13 beds at the University Hospital of Cologne, Germany. The ICU was staffed with cardiothoracic residents in an around-the-clock shift system supervised by a fully trained intensivist. Data were collected daily by a pool of five trained research clerks, as part of routine outcome management initiative. As the study required collection of data only, the Hospital Ethics Committee agreed that informed consent from the patients was not required. We studied all consecutive adult patients (≥18 years) who were admitted after cardiac surgery with cardiopulmonary bypass to our ICU over a period of 3 years. Evaluation of variables was performed using the first year patients who stayed for at least 24 hours. In this construction set (April 1999 to May 2000) we daily evaluated 109 candidate variables known to be important after cardiac surgery including all variables required for the APACHE II, TISS-76 and the MODS scoring systems (see Appendix). The reproducibility was then tested in two validation sets using the data of all adult patients. In the validation set I (May 2000 to May 2001) we daily evaluated 57 variables including all variables of the APACHE II and MODS scores. While all physiologic, demographic and therapeutic data for the construction set and the validation set I were entered into a Microsoft Access database, we used our Intensive Care Information System (Sunrise Critical Care, Eclipsys, Boca Raton, Fl, USA) for the construction set II (February 2002 to February 2003). The Intensive Care Information System is interfaced with the patient monitor (Hewlett-Packard, USA), different types of ventilators (Draeger Evita II and Evita IV, Luebeck; Germany, Siemens Servo 300 and 900, Siemens-Elema, Solna, Sweden), blood gas analysis on ICU (Radiometer, Copenhagen, Denmark) and the central blood test laboratory. The nursing staff has to trigger at least one value for each parameter per hour. Obvious laboratory errors or abnormal results associated with technical problems or clinical interventions such as tracheal suctioning or sedation were omitted by the nurse. In the validation set II we daily evaluated only the 10 variables of our new scoring system (Table 1). For statistical analysis we used SPSS 11.0 for MS Windows, (Chicago, IL, USA). Results are expressed as mean ± SD. A value of p<0.05 was considered significant. Univariate and multivariate statistical methods were used for examination of the study group. The outcome-measure was defined as 30 day mortality. Continuous data significantly associated with 30 day mortality on ICU-day 1 to ICU-day 6 based on two-tailed Student’s t-test were included into a multivariate logistic regression analysis. The same procedure was applied for all candidate categorical variables based on Fisher’s Exact test. The performance of the different scoring systems was assessed by evaluation of calibration and discrimination. Calibration compares the observed mortality with that predicted by the model within severity strata. 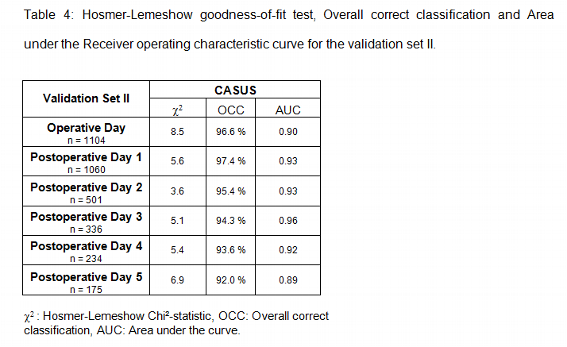 The most accepted method for measuring calibration is the goodness-of-fit statistic , which uses a chi-square-like statistics (Hosmer-Lemeshow chi2 statistics). Small chi2 values and high corresponding p-values indicate a good calibration. Discrimination, or the ability of a scoring system to distinguish between a patient who will live and one who will die, was measured by the area under the receiver operator characteristic (ROC) curve according to Hanley . The ROC curve shows the relation between the true-positive rate (sensitivity) and the false-positive rate (100% - specificity). An area under the curve of 1.0 implies perfect discrimination, whereas an area of 0.5 indicates results that are not better than chance. The overall predictive ability of the new score index was assessed by daily calculating the area under the ROC curve, and compared with the APACHE II, TISS-76 and MODS scoring systems. 3230 patients were admitted to our ICU over the period of 3 years. 106 patients died, indicating an overall hospital mortality rate of 3.3%. From April 1999 to May 2000 (construction set) 1069 patients were admitted to the intensive care unit. Of these patients 384 had an ICU-stay >24 hours and were scored daily. 25 patients died in this group. The length of stay on the ICU was 7.2±10.6 days (range 3-108 days) for this subset of patients. From May 2000 to May 2001 (validation set I) 1057 patients were admitted to our ICU. The mortality rate was 3.0% (32 patients) and the length of ICU-stay was 4.1±6.7 days with a range of 1-97 days. The validation set II (February 2002 to February 2003) consisted of 1104 patients with a mortality rate of 4.4% (49 patients). The length of ICU-stay was 3.2±5.3 days with a range of 1-63 days. In summary, a total of 2545 patients aged 65.4±10.4 years (range of 18-89 years) were scored daily. There were 1793 men (70.5%) and 752 women (29.5%). The operations performed were 1580 (62.1%) isolated CABG, 421 (16.5%) isolated valve surgery, 292 (11.5%) combined CABG with valve surgery, 113 (4.4%) surgery of the thoracic aorta, 46 (1.8%) cardiac transplantation and 93 other procedures including congenital heart disease in adults, pulmonary thromboembolism, cardiac neoplasm, penetrating trauma of the heart, pericardial diseases and pacemaker lead extraction. There were no missing data in all three sets. Tables 2 to 4 summarize the statistical results of the construction set and validation sets I and II. Low values of the Hosmer-Lemeshow chi2 statistic indicate that there are no statistical hints against an assumed fit of the scoring system. The MODS and the CASUS score show the best calibration. 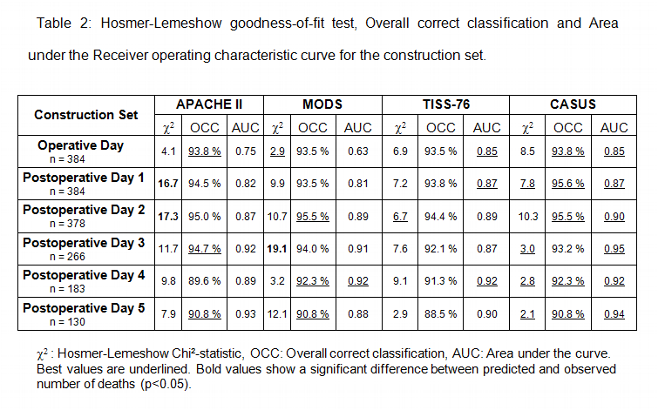 The APACHE II and the TISS-76 did not calibrate as well. In addition the APACHE II showed a significant difference between observed and expected number of deaths on postoperative day 1 and 2 of the construction set. The same was true for the MODS on postoperative day 3 (construction set). The overall correct classification rate (OCC = proportion of patients correctly classified as survivors or nonsurvivors) was best for the CASUS, followed by APACHE II, MODS and TISS-76. The results of the ROC curve indicate a very high discrimination of the CASUS, followed by the TISS-76, the APACHE II and the MODS scores. 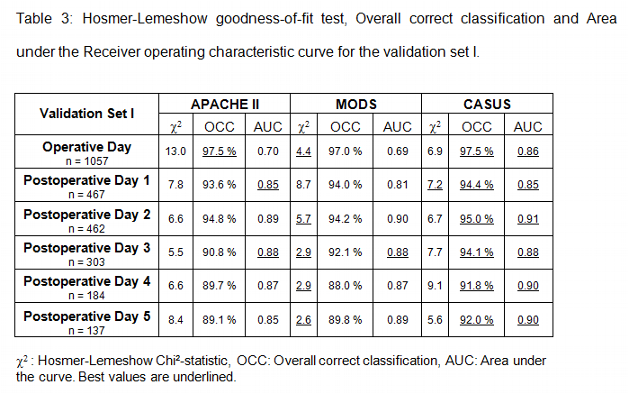 In summary the new scoring system CASUS performed better in terms of overall correct classification values and discrimination when compared to the APACHE II, MODS and TISS-76 scores. Calibration was equal for the MODS and the CASUS scoring systems. The TISS-76 was the most time-consuming scoring system in this study. The objective of this study was to develop a simple scoring system for postoperative cardiac surgical patients. ICU patients have vast amounts of individual data sets generated daily that could potentially serve as predictor variables. An ideal variable should be simple, routinely and reproducibly measured, and readily available in different cardiac ICUs. This is a prerequisite for routine daily prognostic estimates of critically ill cardiac surgical patients [2, 9, 10]. 1. Due to cardiopulmonary bypass these patients may have patho-physiological changes, which may have no impact on outcome . Serum potassium, sodium and glucose are variables of the APACHE II scoring systems, which will revert to normal spontaneously or are corrected readily by the ICU staff. 2. Many physiologic changes may be masked by multiple system support devices, such as intraaortic balloon pumps, ventricular assist devices, hemofiltration and mechanical ventilation . 3. Most cardiac surgery patients with cardiopulmonary bypass are weaned from ventilator support several hours after surgery on the ICU [12, 13]. The Glasgow Coma Scale, a variable of APACHE II and MODS, is affected by therapy in the form of sedation, anesthesia and paralysis. Additionally, its calculation requires clinical evaluation, which may be biased by subjective expectation [2, 4, 9]. In an attempt to simplify daily ICU-scoring in cardiac surgery we reviewed the literature to identify descriptors of mortality and multiorgan dysfunction in postoperative cardiac surgical patients [3, 4, 11-23]. An ideal score consists of a minimum of ideal descriptors. 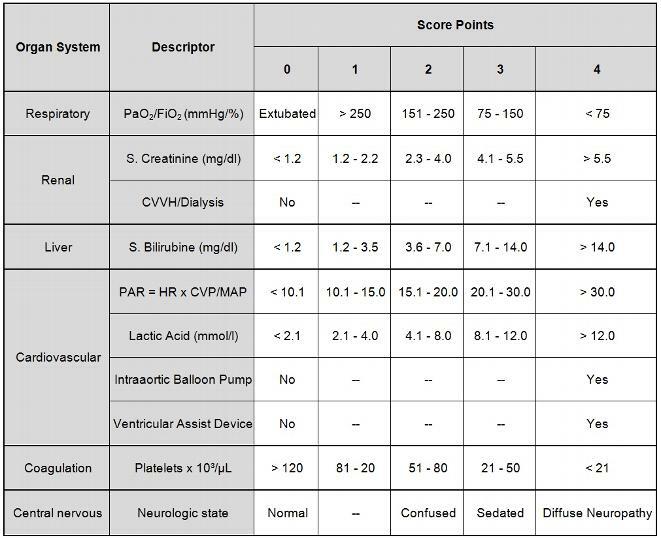 The new developed cardiac surgery score (CASUS) is a compact score index and consists only of ten readily available descriptors (table 1). Three descriptors (PO2/FiO2, lactate, pressure adjusted heart rate) are volatile and may change significantly from one hour to the next. According to the APACHE II we chose for all variables the worst measure per day. Widely used variables of individual organ system function that met our requirements for construct validity, reproducibility and responsiveness [2, 24, 25] were identified and included in the score. Univariate analysis revealed a significant association with 30 day mortality (ICU-day 1 through ICU-day 6) for all variables of the CASUS for all three data sets. Descriptors of the cardiovascular system are the pressure adjusted heart rate (adopted from Marshall et al. ), lactate, intraaortic balloon pump and ventricular assist device. The modified MODS  replaced the pressure adjusted heart rate (PAR) with a combination of heart rate, inotropes and lactate values > 5 mmol/l. In our study the mean heart rate was higher in patients who survived (3 days each in construction set and validation set I), indicating that the heart rate is not a good predictor in cardiac surgery patients. Inotropes (epinephrine, norepinephrine, dopamine and dobutamine) were highly significant for mortality in the validation set I, and are a variable of the SOFA scoring system . We chose not to include the inotropes, because the combination regimens of inotropes differ between ICUs. Moreover, the dosages of inotropes may depend on volume replacement. Cardiac index measures were only available in less than 30 % of all patients in the construction and in the validation set I, and is therefore not an ideal variable. Mixed venous saturation showed no significant association with 30 day mortality in both construction and validation set I.
Lactate proved to be one of the best predictors in postoperative cardiac patients. Most of the scoring systems were constructed at a time when lactate was not readily available. Today lactate is available in every ICU with own blood gas analysis. Davies et al. were able to demonstrate that lactate was the best predictor for intraaortic balloon pumping failure after cardiac surgery. Many physiological changes of the cardiovascular system may be masked by intraaortic balloon pumps (IABP) and ventricular assist devices (VAD), which are commonly used in cardiac surgical patients . Including therapeutical interventions into a score has the potential disadvantage that the organ dysfunction will be described differently between centers because of different practice patterns . Higgins et al. reported an odds ratio of 7.11 in his morbidity model and an odds ratio of 4.46 in his mortality model for the postoperative IABP-usage. VADs may have even a greater impact on outcome and resource allocation compared to IABP insertion. The respiratory system is adequately represented by the arterial PO2/FiO2 ratio. Both PO2 and FiO2 as single variables were less reliable in the construction set and in the validation set I. As in the MODS the hepatic system is best represented by serum bilirubin, and the hematological system by the platelet count. 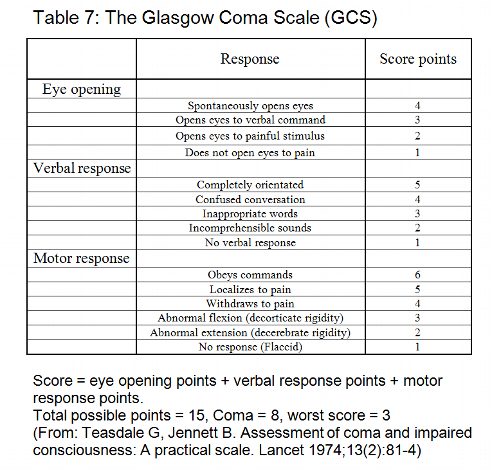 Many scoring systems have included the Glasgow-Coma-Scale (GCS) [1, 2, 9, 26] to describe changes of the central nervous system. Although significant we did not include the GCS in our new scoring system, because the calculation requires several minutes per day and patient. This limits the practicability of a scoring system and the compliance of the staff. Therefore, we constructed a new variable called “Neurologic state” (see Table 1), which is readily available and as significant for mortality as the GCS. Diffuse neuropathy includes signs and symptoms of stroke or cerebral hemorrhage. In order to simplify this scoring system we choose not to use a higher acuity for patients on intraaortic balloon pump, ventricular assist device or renal replacement therapy. Higher acuity may result in even better calibration and discrimination for our patients in this study, but changes over time and different practice patterns in individual institutions may lead to less conformity for the CASUS scoring system. Age was found to be a significant risk factor for morbidity and mortality in several studies dealing with preoperative variables in cardiac surgical patients such as the Cleveland score  and the EuroSCORE . It is also a variable of the APACHE II  and the ICU-Admission scores . Although the risk of open heart surgery is known to be increased above the age of 65 , we were not able to find a significant association with 30 day mortality. We believe the reason for this was our policy in patient selection. As described in Patients and Methods we used our Intensive Care Information System (Sunrise Critical Care, Eclipsys, Boca Raton, Fl, USA) for the construction set II. Since this electronic flow chart records an enormous amount of physiological and therapeutical data, it was only logical to determine the CASUS semi automatically. It is of great importance that all data are validated by the ICU staff. Spurious heart rates caused by loose leads or incorrect blood pressure recordings caused by kinked or dampened arterial or venous lines are common examples of incorrectly stored data variables. To overcome these difficulties every single data which is stored in our Intensive Care Information System has to be validated by the attending nurse. We integrated a program into our Intensive Care Information System that automatically acquires the most abnormal physiological values for severity scoring. The research clerks were advised to validate all data before storing. The calculation of the CASUS takes less than 1 minute per day and patient, which is a prerequisite for its acceptance in other ICUs. The use of an Intensive Care Information System resulted in a very high mortality prediction (see Table 4) with excellent calibration and discrimination. Daily assessment of organ dysfunction is important because doctors and patients need an idea of the risk of ICU mortality. This information prepares the physician for complications and helps to stratify the patient. High scores in individual patients should alert especially young residents to ask for help in the management of these patients. This may potentially save money, but further studies are warranted in this field. Daily scoring also helps the patient and his family to understand the risks and benefits of ICU therapies and clarifies their expectations. This will eventually result in better communication between ICU staff and patient’s relatives. We strongly advise against withdrawing therapy based on a high score in an individual patient, because scoring systems are only accurate for a group of patients and decisions in the ICU should be individual. The new CASUS correlates in a graded fashion with the ICU mortality rate, both when applied on the first day of ICU admission as a prognostic indicator and when calculated over the ICU stay as an outcome measure. The variables of the CASUS are simple, routinely and reproducibly measured, and when combined with a semi automated intensive care information system completed in less than 1 minute per patient and day. Thus, the CASUS may serve as an Expert System for diagnosing organ failure, decision making, resource evaluation, and predicting mortality in ICU cardiac surgical patients. We recommend its widespread use in combination with a preoperative risk stratification model like the EuroSCORE . 1. Knaus WA, Draper EA, Wagner DP, Zimmerman JE. APACHE II: a severity of disease classification system. Crit Care Med 1985; 13(10):818-29. 2. Marshall JC, Cook DJ, Christou NV, et al. 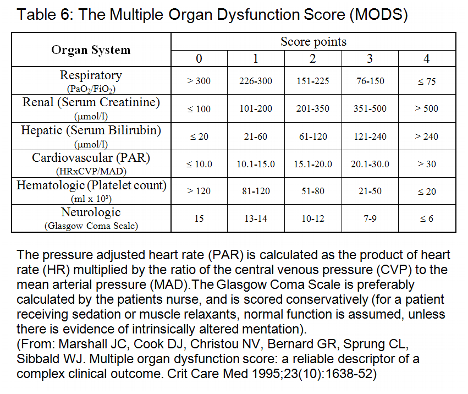 Multiple organ dysfunction score: a reliable descriptor of a complex clinical outcome. Crit Care Med 1995; 23(10):1638-52. 3. Ryan TA, Rady MY, Bashour CA, et al. Predictors of outcome in cardiac surgical patients with prolonged intensive care stay. Chest 1997; 112(4):1035-42. 4. Turner JS, Morgan CJ, Thakrar B, Pepper JR. Difficulties in predicting outcome in cardiac surgery patients. Crit Care Med 1995; 23(11):1843-50. 5. Keene AR, Cullen DJ. 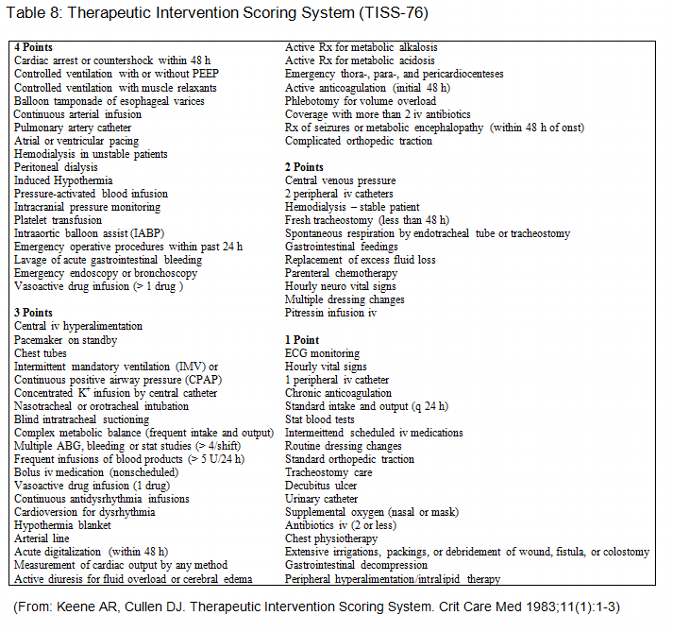 Therapeutic Intervention Scoring System: update 1983. Crit Care Med 1983; 11(1):1-3. 6. Wagner DP, Knaus WA, Harrell FE, et al. Daily prognostic estimates for critically ill adults in intensive care units: results from a prospective, multicenter, inception cohort analysis. Crit Care Med 1994; 22(9):1359-72. 7. Hosmer DW, Hosmer T, Le Cessie S, Lemeshow S. A comparison of goodness-of-fit tests for the logistic regression model. Stat Med 1997; 16(9):965-80. 8. Hanley JA, Hajian-Tilaki KO. Sampling variability of nonparametric estimates of the areas under receiver operating characteristic curves: an update. Acad Radiol 1997; 4(1):49-58. 9. Marik PE, Varon J. Severity scoring and outcome assessment. Computerized predictive models and scoring systems. Crit Care Clin 1999; 15(3):633-46, viii. 10. Bosman RJ, Oudemane van Straaten HM, Zandstra DF. The use of intensive care information systems alters outcome prediction. Intensive Care Med 1998; 24(9):953-8. 11. Turner JS, Mudaliar YM, Chang RW, Morgan CJ. 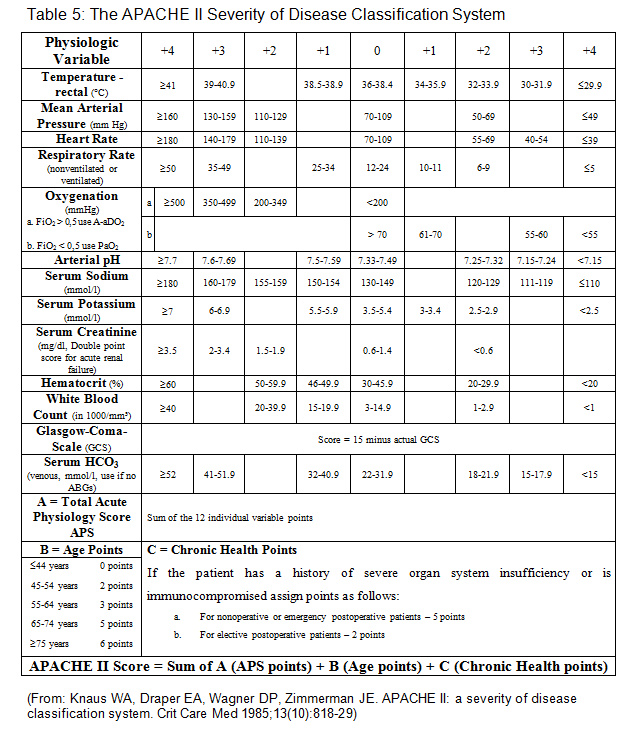 Acute physiology and chronic health evaluation (APACHE II) scoring in a cardiothoracic intensive care unit. Crit Care Med 1991; 19(10):1266-9. 12. Rady MY, Ryan T. Perioperative predictors of extubation failure and the effect on clinical outcome after cardiac surgery. Crit Care Med 1999; 27(2):340-7. 13. Kollef MH, Wragge T, Pasque C. Determinants of mortality and multiorgan dysfunction in cardiac surgery patients requiring prolonged mechanical ventilation. Chest 1995; 107(5):1395-401. 14. Becker RB, Zimmerman JE, Knaus WA, et al. The use of APACHE III to evaluate ICU length of stay, resource use, and mortality after coronary artery by-pass surgery. J Cardiovasc Surg (Torino) 1995; 36(1):1-11. 15. Rady MY, Ryan T, Starr NJ. Perioperative determinants of morbidity and mortality in elderly patients undergoing cardiac surgery. Crit Care Med 1998; 26(2):225-35. 16. Iezzoni LI. The risks of risk adjustment. Jama 1997; 278(19):1600-7. 17. Pilz G, Fraunberger P, Appel R, et al. Early prediction of outcome in score-identified, postcardiac surgical patients at high risk for sepsis, using soluble tumor necrosis factor receptor-p55 concentrations. Crit Care Med 1996; 24(4):596-600. 18. Martinez-Alario J, Tuesta ID, Plasencia E, et al. Mortality prediction in cardiac surgery patients: comparative performance of Parsonnet and general severity systems. Circulation 1999; 99(18):2378-82. 19. Lazar HL, Fitzgerald C, Gross S, et al. Determinants of length of stay after coronary artery bypass graft surgery. Circulation 1995; 92(9 Suppl):II20-4. 20. Rady MY, Ryan T, Starr NJ. Early onset of acute pulmonary dysfunction after cardiovascular surgery: risk factors and clinical outcome. Crit Care Med 1997; 25(11):1831-9. 21. Davies AR, Bellomo R, Raman JS, et al. High lactate predicts the failure of intraaortic balloon pumping after cardiac surgery. Ann Thorac Surg 2001; 71(5):1415-20. 22. Higgins TL, Starr NJ. Risk stratification and outcome assessment of the adult cardiac surgical patient. Semin Thorac Cardiovasc Surg 1991; 3(1):88-94. 23. Ferraris VA, Ferraris SP, Singh A. Operative outcome and hospital cost. J Thorac Cardiovasc Surg 1998; 115(3):593-602; discussion 602-3. 24. Cook R, Cook D, Tilley J, et al. Multiple organ dysfunction: baseline and serial component scores. Crit Care Med 2001; 29(11):2046-50. 25. Jacobs S, Zuleika M, Mphansa T. The Multiple Organ Dysfunction Score as a descriptor of patient outcome in septic shock compared with two other scoring systems. Crit Care Med 1999; 27(4):741-4. 26. Vincent JL, Ferreira F, Moreno R. Scoring systems for assessing organ dysfunction and survival. Crit Care Clin 2000; 16(2):353-66. 27. Higgins TL, Estafanous FG, Loop FD, et al. ICU admission score for predicting morbidity and mortality risk after coronary artery bypass grafting. Ann Thorac Surg 1997; 64(4):1050-8. 28. Nashef SA, Roques F, Michel P, et al. European system for cardiac operative risk evaluation (EuroSCORE). Eur J Cardiothorac Surg 1999; 16(1):9-13.